It is not a ten year old - bogus deal. Looks nice - and if you are making an order on line you can claim free champagne if you spend over £100. Where does it say this is 10YO? TONEL 12 is their 10 YO, but this just says "Limited Edition" . Is it a standard Tawny in a better bottle for Waitrose? It's £15,000 Euro dollars from Portugal via Thailand. You won't unless you're rich, very rich and apt for wasting monies. Where does it say this is 10YO? TONEL 12 is their 10 YO, but this just …Where does it say this is 10YO? TONEL 12 is their 10 YO, but this just says "Limited Edition" . Is it a standard Tawny in a better bottle for Waitrose? just visit a store or spend £60 on groceries. Still waiting to know where the 10 year old comes from .....Do not say …Still waiting to know where the 10 year old comes from .....Do not say school. Please elaborate: is that sarcasm or do you mean you are quoting Waitrose? I cant see any reference to age on the website - is it on the bottle? Went in yesterday. Undesignated tawny port in a twee wooden box. Not a ten year old tawny. Not the one OP makes refernce to on vivino. This is a young tawny port, produced through rapid aging in small, old oak 550 litre pipes to give an aged appearance and flavour. It is blended from our stocks of port to give this young Tawny its characteristic style which will be the same from year to year. 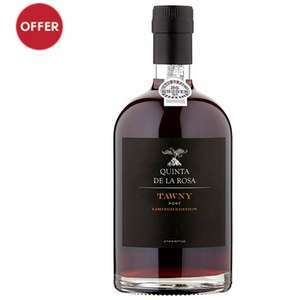 As with all La Rosa products, this Tawny is bottled at La Rosa, allowing us to ensure quality from grape to bottle. Unlike most port shippers, all products are stored and bottled in the Douro (at La Rosa and not Porto), allowing full traceability and ensuring quality from grape to bottle. This is best consumed within 2-3 years. Why arent the mods all over this like a rash? Wow just stumbled across this, dvdvicar you’re very authoritarian on your port!